MLB Ejection & Instant Replay Review Statistics and Umpire Sabermetrics through All-Star Break 2015 are now available. 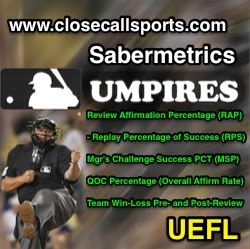 Visit 2014's Instant Replay Review Statistics 101: Week 1 Sabermetrics for an introduction to Ejection & Replay Review definitions and terms, including Review Affirmation Percentage (RAP), also known as QOC (Quality of Correctness), Replay Percentage of Success (RPS), alternatively, 1.000 - RAP = RPS, and Manager's Challenge Success Percentage (CSP). Also included is Team Success Percentage (TSP), which includes all Replay Reviews; both Manager's Challenges and Crew Chief Reviews. The following presentation includes summaries and detailed analysis for ejections and replay data gathered during baseball season's ceremonial first half. >> 126 Total Regular Season Ejections through July 12, 2015 ("Ceremonial First Half"). >> Umpires were 67.0% accurate on calls associated with ejection. >> The Padres were ejected more often than any other team; the NL West led all MLB divisions. >> The D-Backs & Marlins were ejected least often; the AL West trailed all MLB divisions. >> Ex-Manager Bud Black formerly of the Padres led all managers in ejections. >> Player Matt Kemp of the San Diego Padres led all players in ejections. >> Umpire Holbrook led all umpires; Tripp Gibson was the most accurate ejector (highest E-QOC). >> Tim Welke & John Hirschbeck's crews tied to lead all of baseball in ejection activity. >> Most ejections occurred in the 7th inning; Ejections from 7th and on comprised 50% of all tosses. >> Most ejections occurred on Sundays. Weekend series (Fri-Sun) featured 48% of all heave-ho's. >> 687 Total Replay Reviews, of which calls were affirmed 53% of the time (47% overturned). >> The Tampa Bay Rays used replay more than any other team, but were the 2nd least accurate (LA). >> Chip Hale (ARI) led the league in accuracy. >> The league average manager was successful in challenging a play 49% of the time. >> Umpires Baker and Bucknor saw at least 15 of their calls reviewed, each, more than any other umpire. >> John Hirschbeck's crew led all of baseball in replay activity by a significant margin. >> Umpire Alfonso Marquez led the league in accuracy with all of his calls affirmed by replay. >> Umpire Paul Nauert experienced the highest rate of his calls being overturned by replay. Games Played to date: 1330 of 2430 (54.7% of the season has been played). Ejections: 126. At this pace (126 E / 1330 G), there will be 230 Ejections at regular season's end. "Team most active" (Team with most Ejections): SD 12; KC 10; BOS 7; LAD, TOR 6. "Team least active" (Team with least Ejections): ARI, MIA 1; TEX, OAK, MIN, LAA 2. "Manager ejections leader" (Most Ejections): Bud Black (SD) 4; Mattingly/Ausmus/Bochy/Hurdle/Farrell/Gibbons 3. "Player ejections leader" (Player ejection leader): Matt Kemp 3; Harper/Ventura/Ortiz/Cain/Napoli 2. "Umpire leader" (Umpire with most Ejections): Sam Holbrook 7; Greg Gibson 5. "Crew most active" (Crew Chief whose crew has most Ejections): John Hirscbheck & Tim Welke 3. "Most accurate umpire" (Umpire with greatest Simple QOC): Tripp Gibson - QOCY 1.000 (4/4). "Overall QOC percentage" (Overall QOC Y value): .670 (63 Y / 31 N) + 32 Irrecusable = 126 Total. "Team Status Pre-Ejection" (Winning-Losing-Tied [W-L-T] Record prior to Ejection): 27-67-32. "Team Status Post-Ejection" (Game Record [W-L]): 53-73. (Delta: 26-6; WPCT: .813). By Inning: 7 (27), 8 (26), 5 (19), 6 (12), 3 (10), 4 (10), 2 (8), 9 (7), 1 (4), Extras (3). By Reason: Balls/Strikes (61, QOC .656), Check Swing (20, QOC .850), Throwing At (8), Replay Review (7), Unsportsmanlike-NEC (6), Fighting (5), Warnings (4), Safe/Out (3, QOC .000), HBP/Foul (3, QOC .333), Balk (3, QOC 1.000), Fair/Foul (2, QOC .500), Illegal Substance (2), Interference/Obstruction (2, QOC .500). By Day of Week: Sun (27), Tues (19), Wed (19), Thurs (19), Sat (18), Fri (15), Mon (9). Replay Reviews & Decisions Rendered: 687, .534 RAP (367/687). - Crew Chief Reviews (Replay Reviews initiated by the Umpire Chief): 82 (12%), .744 RAP. - Manager's Challenges (Replay Reviews initiated by the Club Manager): 605 (88%), .506 RAP. "Team Most Used" (Made use of Replay Review most often): TB 39; CHC, TEX 32; TOR 31; BOS 30. "Team Least Used" (Least use of Replay): STL 10; KC 14; CLE 15; ARI, SEA 16; CIN, DET, WAS 17. "Most successful Manager" (Manager with highest CSP): Chip Hale (ARI) - .714. "League average Manager" (Average CSP for all Managers): .494. "Least successful Manager" (Manager with lowest CSP): Kevin Cash - .250. "Most successful team in review" (Team with highest TSP): Milwaukee Brewers - .650 (13/20). "Umpire most questioned" (Most Replay Reviews): Jordan Baker 16; CB Bucknor 15. "Crew most questioned" (Crew Chief whose crew has most Reviews): Hirschbeck 47; Meals 40. "Most accurate umpire" (Umpire with greatest RAP): Alfonso Marquez - 1.000 in 5/5. "Ump of greatest overturn" (Umpire with lowest RAP): Paul Nauert - .000 in 0/3. Team Status Pre-Review (Winning or Losing prior to review [Win-Loss-Tied]): 194-285-208. Team Status Post-Review (Game Record [W-L]): 316-371. (Delta: 122-86; WPCT: .587). - By Inning: 8 (98), 1 (85), 5 (82), 7 (82), 3 (72), 6 (68), 9 (65), 4 (60), 2 (56), Extras (19). - By Reason: Safe/Out (553), HR/Not HR (48), HBP/Foul (33), Fair/Foul (11), Catch/Trap (11), HP Rule (11). - By Day of Week: Sat (120), Sun (118), Fri (115), Wed (103), Tues (98), Mon (75), Thurs (58). 1. Tampa Bay Rays: 39. 10/39 Overturned Calls = .256 Team Success Percentage (TSP). 2. Texas Rangers: 32. 10/32 = .313. 2. Chicago Cubs: 32. 15/32 = .469. 4. Toronto Blue Jays: 31. 13/31 = .419. 5. Boston Red Sox: 30. 12/30 = .400. 6. San Diego Padres: 29. 14/29 = .483. 7. Colorado Rockies: 28. 14/28 = .500. 7. Los Angeles Angels of Anaheim: 28. 14/28 = .500. 9. Pittsburgh Pirates: 27. 13/27 = .481. 10. Los Angeles Dodgers: 25. 6/25 = .240. 1. ARI - Chip Hale (Arizona Diamondbacks) - .714. 2. SEA - Lloyd McClendon (Seattle Mariners) - .667. 3. MIL - Craig Counsell (Milwaukee Brewers) - .650. 4. NYY - Joe Girardi (New York Yankees) - .625. 4. MIA - Mike Redmond/Dan Jennings (Miami Marlins) - .625. 6. MIN - Paul Molitor (Minnesota Twins) - .619. 7. CIN - Bryan Price (Cincinnati Reds) - .600. 8. BAL - Buck Showalter (Baltimore Orioles) - .588. 9. PIT - Clint Hurdle (Pittsburgh Pirates) - .550. 10. NYM - Terry Collins (New York Mets) - .545. 11. SD - Bud Black/Pat Murphy (San Diego Padres) - .538. 11. KC - Ned Yost (Kansas City Royals) - .538. 13. SF - Bruce Bochy (San Francisco Giants) - .526. 14. COL - Walt Weiss (Colorado Rockies) - .520. 14. LAA - Mike Scioscia (Los Angeles Angels of Anaheim) - .520. 16. HOU - AJ Hinch (Houston Astros) - .500. 16. OAK - Bob Melvin (Oakland Athletics) - .500. 16. CLE - Terry Francona (Cleveland Indians) - .500. 16. STL - Mike Matheny (St. Louis Cardinals) - .500. League Average - .494 (299/605 Challenges Overturned). 20. CHI - Joe Maddon (Chicago Cubs) - .483. 21. PHI - Ryne Sandberg/Pete Mackanin (Philadelphia Phillies) - .474. 22. DET - Brad Ausmus (Detroit Tigers) - .467. 23. CWS - Robin Ventura (Chicago White Sox) - .458. 24. WAS - Matt Williams (Washington Nationals) - .455. 25. BOS - John Farrell (Boston Red Sox) - .444. 26. TOR - John Gibbons (Toronto Blue Jays) - .440. 27. ATL - Fredi Gonzalez (Atlanta Braves) - .435. 28. TEX - Jeff Banister (Texas Rangers) - .310. 29. LAD - Don Mattingly (Los Angeles Dodgers) - .261. 30. TB - Kevin Cash (Tampa Bay Rays) - .250. *Team's manager(s) designated on the club's active coaching roster listed in this section. Keep in mind this may also be a function of bench coach and/or clubhouse video coordinator affinity. 1. Alfonso Marquez - 1.000 (5/5). 2. Pat Hoberg - 1.000 (2/2). 2. Quinn Wolcott - 1.000 (2/2). 2. Alan Porter - 1.000 (2/2). 5. Mark Carlson - .917 (11/12). 6. Kerwin Danley - .857 (6/7). 7. Adam Hamari - .818 (9/11). 8. Mark Ripperger - .800 (4/5). 8. Paul Emmel - .800 (4/5). 8. Brian Gorman - .800 (4/5). 8. David Rackley - .800 (4/5). 12. Sam Holbrook - .778 (7/9). 13. Marty Foster - .750 (9/12). 14. Marvin Hudson - .750 (3/4). 15. Fieldin Culbreth - .714 (5/7). 15. Gary Cederstrom - .714 (5/7). 17. Dana DeMuth - .667 (6/9). 18. Gerry Davis - .667 (4/6). 18. Hunter Wendelstedt - .667 (4/6). 18. Jerry Layne - .667 (4/6). 18. Gabe Morales - .667 (4/6). 22. Rob Drake - .667 (2/3). 23. Manny Gonzalez - .636 (7/11). 23. Chris Guccione - .636 (7/11). 23. Jeff Nelson - .636 (7/11). 26. James Hoye - .600 (6/10). 26. Clint Fagan - .600 (6/10). 26. Brian O'Nora - .600 (6/10). 29. DJ Reyburn - .600 (3/5). 29. Mike DiMuro - .600 (3/5). 29. Ryan Blakney - .600 (3/5). 32. John Hirschbeck - .571 (8/14). 32. Ron Kulpa - .571 (8/14). 34. Tim Timmons - .571 (4/7). 35. Joe West - .556 (5/9). 35. Angel Hernandez - .556 (5/9). 35. Jeff Kellogg - .556 (5/9). 35. Mark Wegner - .556 (5/9). 68. Jerry Meals - .400 (4/10). 68. Tim Welke - .400 (4/10). 69. Larry Vanover - .375 (3/8). 69. Chris Conroy - .375 (3/8). 69. Tony Randazzo - .375 (3/8). 72. Tom Hallion - .333 (3/9). 73. Chad Fairchild - .333 (2/6). 74. Brian Knight - .333 (1/3). 74. Marcus Pattillo - .333 (1/3). 76. Bill Welke - .308 (4/13). 77. Mike Everitt - .286 (2/7). 77. Scott Barry - .286 (2/7). 77. Ed Hickox - .286 (2/7). 77. Mike Muchlinski - .286 (2/7). 81. Dan Bellino - .250 (2/8). 82. Phil Cuzzi - .250 (1/4). 82. Sean Barber - .250 (1/4). 84. Will Little - .200 (1/5). 85. Paul Nauert - .000 (0/3). 86. Ted Barrett - .000 (0/2). 87. Ben May - .000 (0/1).